The injury to Fernandinho could have derailed Manchester City's Premier League title bid but that hasn't happened. It's thanks to the brilliance of Ilkay Gundogan that they remain on track, writes Adam Bate. Amid the celebrations that followed the Carabao Cup final penalty shootout victory over Chelsea last month, there was a major concern for Manchester City supporters. Immediately after the game, Pep Guardiola revealed that injuries to the key duo of Aymeric Laporte and Fernandinho would be keeping them out of action "for weeks" to come. Laporte had started more Premier League games for City than any other outfield player this season but at least there were obvious replacements. It was the loss of Fernandinho that was seen as potentially decisive in the title race. Up to that point, City had played only two Premier League games all season without the Brazilian - and they had lost them both. As it has turned out, Manchester City have managed to win five in a row without their holding midfielder. Much of the credit for that must go to Ilkay Gundogan for making light of Fernandinho's absence. He has given everyone a reminder of his versatility. Guardiola has always been an admirer. He described Gundogan as "an incredible player in all senses" after the win over Watford last time out in the Premier League and it was easy to see why. The German playmaker dominated possession throughout, making 104 passes in the opposition half and creating more chances than any other player on the pitch. Interestingly, the one other midfielder to hit those passing numbers so far this season is Chelsea's Jorginho. He had been a summer target for City prior to his move to Stamford Bridge, but is yet to earn the reviews that Gundogan is now getting in that deep-lying role. Indeed, it might seem curious that Guardiola was ever interested in using Jorginho there instead. Perhaps the clue is that he still doesn't really see that as Gundogan's position. Speaking after a win over Basel last season, he described him as "a special player with a lot of personality" but it almost seemed pointed that he referred to Gundogan as an "attacking midfielder" - one of three options there alongside David Silva and Kevin De Bruyne. The 28-year-old can play in that advanced position, of course, but the role that he is currently performing in Fernandinho's absence is the one in which he first captured wider attention during his days at Borussia Dortmund. Jurgen Klopp certainly saw him in this deeper role. Klopp called him a "complete player" and it reflects Gundogan's intelligence that he has been able to revert back to this deeper position so easily. His distribution from there has even added a new dimension - as shown by some of his gorgeous passing in the 7-0 win over Schalke. It was his incisive through-ball that set up Sergio Aguero's second goal. There will still be some reservations. Against Swansea, it was noticeable that the opposition midfielders were able to find space in behind him at times, and it's surely inevitable that he will not be able to provide this City side with the same level of protection as Fernandinho. As well as those games against Schalke and Swansea, City have been a little fortunate that their Premier League fixtures have been against West Ham, Bournemouth and Watford. Gundogan's heatmap for these three games shows that despite being deployed as the deepest of the City midfielders, he has still been able to play in similar areas to before. Would Fernandinho's absence prove more telling against, say, Manchester United? That is something for Guardiola to ponder. But Gundogan has helped City through this passage of games and it may be that this run of results will be seen as crucial come May. No wonder the manager would be happier if his problem solver was tied down to a new deal. "He knows what we want, he knows what we think about him, but it's the same as other cases like we said in the past," Guardiola said recently when discussing contract talks that appear to have stalled despite the fact that Gundogan's deal ends in the summer of 2020. "The final decision is not in our hands. We try to speak with him, we want him to extend the contract right now. Yesterday would have been better than today, and today better than tomorrow. But if he doesn't want to, we cannot do anything else." Gundogan has been coy so far, stopping short of confirming his intention to extend his stay. He made a point of saying that he is "not the youngest any more" by way of an explanation for taking time to ensure that his decision is the right one. "It may well be that the next one will be my last big contract," he said. "Such a decision must be well considered." 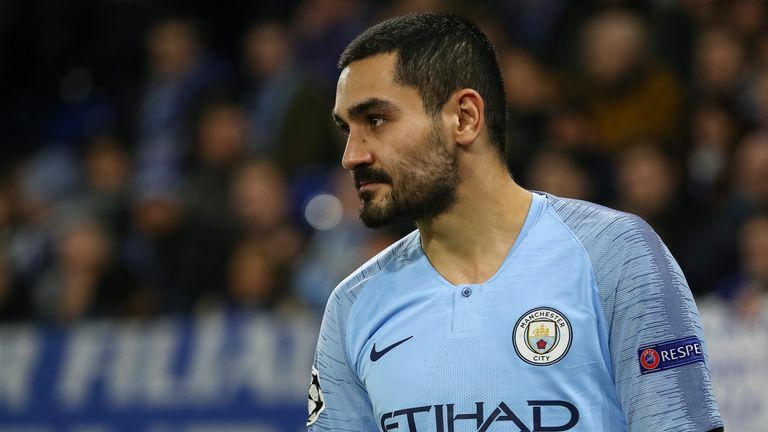 Watch Ilkay Gundogan in action for Manchester City against Fulham live on Sky Sports Premier League from 11.30am this Saturday.